Our former gallery location as closed. IDIO Gallery is the radical host to experimental art and music in New York. IDIO was a contemporary art gallery and performance space located between iron and auto workshops in East Williamsburg, Brooklyn. The 100-year-old space was once a horse barn, a muralist headquarters and a rave dungeon. 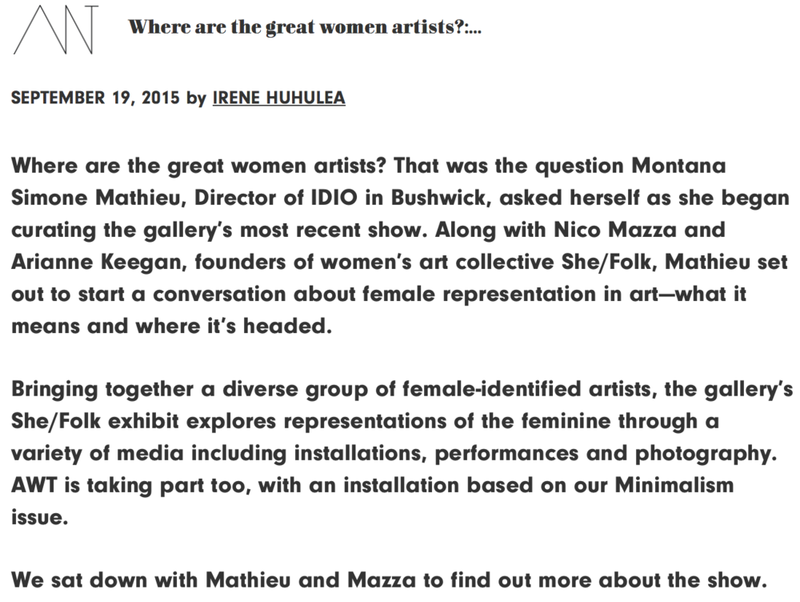 Originally founded as Idiosyncrasy in 2013 by Mary-Evelyn Pritchard, the gallery was re-opened by Montana Simone as Idio in 2015. As a curator, Montana aims to foster iconoclastic arts, challenging thought and the experience of freedom in a time of consumerist conformity - seeking experimental work across media, from 2D (painting, illustration, printmaking, collage, etc) to sculpture, installation, performance, sound art, experimental film and video and music. This DIY and gallery space opened in May of 2015, and aside from live shows, also hosts a whole range of art installations that include 2D, sculpture, performance art, conceptual art, sound art, and an experimental film series. All of this programming is curated fully by Montana Simone, who is also the director for the space. The sound art installations series, IDIO:Soundlab, is co-curated by sound artist and DJ Maria Chavez. One of the venue’s biggest upcoming projects is a festival called the Royal Oakie Fest that seeks to unite unsigned indie bands from both coasts. The festival will run next weekend, May seventh and eighth, and will also feature visual art from Yasamine June on display, booths by local jewelry makers and independent music stores and food vendors from nearby restaurants. But that’s just one example of Idio’s focused, diverse programming. All of the equipment at the venue is provided by supportive friends and community members–a feat unto itself. This is clearly an artistic hub that you will be hearing more and more about as they enter into their second year of existence. The best part: Simone coined the term “psychofolkgarage” for the type of music she tends to book, a wide variety of rock, psych, garage, punk and folk.